What did you think of Mindhunters? 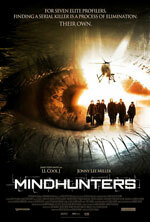 An intense thrill ride of a movie, Mindhunters focuses on FBI agents-in-training. The group of profilers are dropped on an island used for training in order to be immersed in their training exercise. However, instead of training for real-life profiling situations, they are dealing with a real-life killer on the island who’s after them. The ensemble cast has a unique chemistry within them. There is no single “star” of the movie. Everyone has an equal chance of being the next one to die. Speaking of which, the deaths are shocking, horrifying to watch, and start very early in the movie. Twists and turns abound as the group turns on each other. Naturally they start to suspect one another, while still needing to trust each other to uncover the identity of the killer. Simply stated: it’s a good movie. In fact, I’m disappointed I didn’t see it in the theater. I recommend you Netflix it right now.